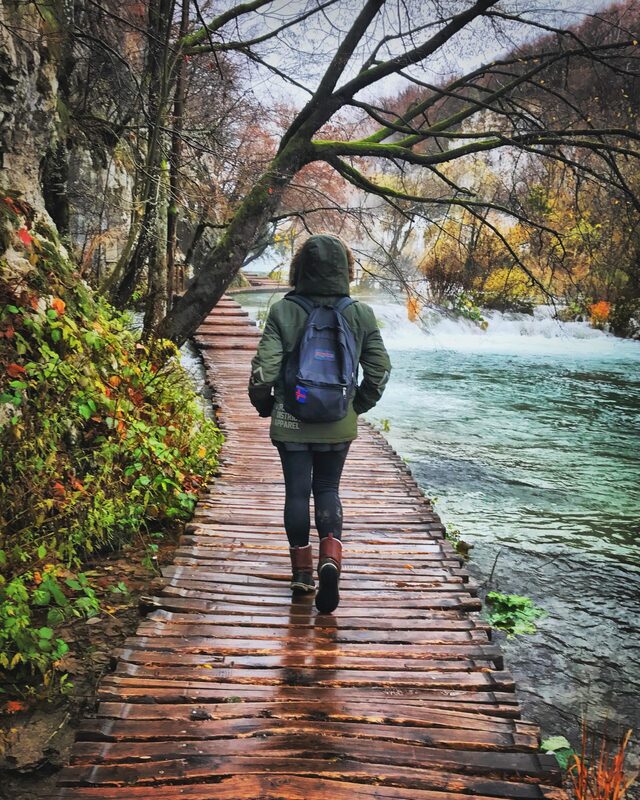 Last fall we trekked through Europe for a solid 6 weeks. When we tell people, their first question is always “How much did that cost you?” When we tell them we spent less than $5,000 total for the two of us, people are shocked. Okay, so it takes a lot of planning. In fact, even with all of the online travel blogs available in 2016 we still spent the majority of our free time from May to October planning the trip, finding destinations we could afford to get to and calculating how much we could save if we worked no less than 40 hours a week. So, as it came time to set off on our adventure, Patrick and I had a combined amount of about $6,000, and a credit card just in case we needed to use it. So without further ado, here’s how we did it! In the table below you can see how much we spent in each country per day on average. The average cost per person for our entire Europe trip was $43.70 per day. It’s pretty clear to see that Switzerland, Italy, and The Netherlands cost us the most per day on average. It is worth noting that we went out to eat for nearly every meal the first week in Italy, which significantly added to our costs per day. The rest of the trip we shopped at grocery stores and cooked our own meals, which is much cheaper than eating out. Italy can easily be done on a budget of $50/day if you shop at grocery stores and cook your own meals. It’s also worth noting that the further east you go in Europe, the cheaper things get. For example, the cheapest countries we visited were Croatia, Slovenia, Hungary, and the Czech Republic (Czechia). The only reason we spent as much as we did in Hungary was because our hostel lacked a real kitchen (we just had a microwave), and so we ended up eating out most of our time in Budapest. It can even be done cheaper if you fly back from a non-Amsterdam airport (this is an expensive place to fly into & out of from the US). When I flew to Brussels back in May, 2016, I had booked roundtrip tickets through TUIfly out of Miami for $550, and they were direct flights!! So if you are looking for an even cheaper option to get to Amsterdam I suggest looking at flying in to Brussels and taking a train to Amsterdam. So when you get to Europe, you will need some form of local transportation. You could rent a car (40-50 EUR/day), take a taxi (10-50 EUR), take the metro/bus, or walk. Typically, we booked accommodation within a mile or two of where we were to arrive, and since most Flix buses will drop off and pick up at central train stations this means its close to the city center, again making it easier to walk places. More walking = less money spent on transportation. If we were too tired to walk miles with our packs on, we would take the metro or public bus for a small fee (1.50-3 EUR). There were a couple of times where we had to take a taxi or train to get to our hostel or Airbnb, and although a 6 km taxi ride in Budapest split 3 ways doesn’t come out to much, this can definitely get expensive if you soley rely on taxi’s to get around. By far the number one mode of transportation I recommend for traveling long distances in Europe is FlixBus. The most we paid for a FlixBus ticket on our trip was 26 EUR each to get from Salzburg to Ljubljana, a 7 hour drive, but we also booked many of our tickets for as little as 5 EUR each. Many people don’t realize this option and opt to take a train, which is usually twice to triple the price of what it costs to take a bus! Flixbuses are pretty comfortable and all are equipped with wifi. Most of them have plugs as well for you to charge your phone, but charge it before you get on just in case it’s one of the buses that doesn’t have electrical outlets. Even though they do take slightly longer than trains to reach your destination, they are so much cheaper we found it worth it. Some things to note about FlixBus include the fact that they only run between bigger cities. If you are trying to get to a smaller city then you may need to take a local bus or a train. For example, we had to take a train when we traveled to Cinque Terre as a day trip from Florence. Furthermore, you will need to check their schedule before your trip. Some of their buses that don’t run to large cities may only leave a couple times a week, so plan on purchasing your tickets at least one week in advance. We know many people who have planned on buying their tickets the day before, only to realize that all the buses are booked up for that day. This is especially true for the high seasons. Also, if you are traveling really long distances then look into flights. For example, when we were looking to get to Amsterdam from Berlin, a Flixbus cost $45 and would take about eight hours, but a one and a half hour flight only cost $57. In this situation, due to our limited time in Europe we didn’t want to spend half the day on a bus when we could take a quick flight for only $12 more, so we opted to fly instead. Finally, although it only happened once to us, it is possible for your bus just not to show up. Like, at all. This happened to us in Vienna. Our plan was to take a night bus to Brno, spend a day there, and then the next night head to Prague. We waited two hours for our bus to show up, but it never did, and the people at the bus station were no help at all. We called FlixBus, were informed our bus wasn’t coming, and although they were helpful on the phone and told us to book a train and they would reimburse us, we were unable to do so due to the fact that it was nighttime and there were no more trains leaving that day. We ended up having to find a last minute hostel in Vienna, had to pay for our hostel in Brno because it was too short notice to cancel, and had to spend an extra 16 EUR each on a FlixBus ticket the next day from Vienna to Prague. Furthermore, we were never reimbursed for this ticket and never got our money back from FlixBus, despite the many emails we sent explaining our situation. It just goes to show that you must be prepared for things to go wrong while traveling. All you can do is learn from the situation and move on, and at least you’ll be left with a story to tell afterwards. We looked on the bright side of the situation and although we lost out on some money this day, we got to spend an extra day in Prague, which ended up being one of our favorite cities in Europe! Our trip consisted of alternating between hostels and Airbnb’s, just depending on what we could find for the cheapest price that was within walking distance of the city center. You can read more about methods we use to find cheap accommodation here. The total amount we spent (per person) on accommodation was $529.60. This averages out to about $13/night!! The cheapest accommodation we found on our trip was in Prague, where we stayed at Clown and Bard for $7.83/night per person! The most expensive place we stayed at was Hostel Sarphati in Amsterdam, where the cheapest hostel we could find was $26.46/night each. Excluding the first week in Italy, we didn’t eat out much. Instead, we went to grocery stores and bought cheap food to cook ourselves (it’s important to make sure your hostel has a kitchen you can use before booking if you are planning on doing this). Eating out racks up your expenses significantly, so this is one of the top pieces of advice we can give to those looking to travel on a budget: COOK YOUR OWN FOOD!!! You could spend 8 euros on one meal at a restaurant, or you could use that 8 euros to buy rice, beans, and chicken at a market or grocery store and have food to last you 2 days. If you do find yourself hungry while out and about, chose cheaper places to eat like pizza restaurants or kebab shops. You can find 12 inch Margherita pizzas in Italy for about 5-6 EUR each, and a massive kebab will run you 2-5 EUR, depending on the country. Below is a picture of Pat eating a kebab in Croatia that cost us 2 euros!! When planning a trip to Europe, it’s important to budget for entrance fees. We spent $79.29 each for our six week trip on entrance fees alone. Some activities on our trip that required entrance fees were Cinque Terre ($16 entrance fee per person), the park entrance fee for Cesky Raj ($4 per person), and Plitvice Lakes National Park ($18 per person). These costs may or may not apply to you, but were important to include as they did make up a portion of our money spent. It’s also important to budget for miscellaneous costs (medicine, mail, etc. ), just in case anything goes wrong. Ulmon City Maps2Go. You can get the Ulmon City Maps2Go app in the App Store. This app allows you to download city or country maps while you have wifi, and then use them offline. Words cannot explain how clutch this was while wandering the streets of Europe trying to find where you are going. It even shows your location on the map while offline! We use this app every time we travel abroad. Available for both Apple and Android. So there you have it, a complete guide to how we backpacked through Europe for 6 weeks under $2,500 each! And its possible to backpack Europe even cheaper by cooking all your own meals, Couchsurfing to stay at peoples homes for free, camping, and avoiding miscellaneous costs (alcohol, souvenirs, etc.). The picture above shows the route we backpacked on our trip. For an interactive map or to see what we’re planning next, check out our TripLine here. Have you ever backpacked Europe before? How much did it cost you? Leave a comment below! **Note: We were not paid to promote any of the companies above. We included them for your convenience and to convey how we successfully planned our trip and traveled throughout Europe for cheap. Whereas there are many ways to travel for cheap, here we outline what worked for us, and we hope it works for you, too!